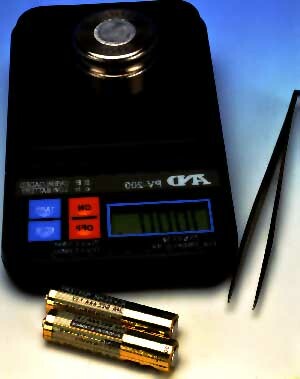 The PV Series is a portable pocket scale designed for field-testing and quality control. It features four units of measure ranging from grams, ounces, troy ounces, and pennyweight. A large LCD display, low battery indicator, automatic power off function, simple fast calibration, and a tare push-button for quick, easy re-zeroing are included. This unit also includes two AAA batteries, calibration weight, vinyl carrying case, and a full one-year warranty. There are four models available, each with different capacities, including: 60g x 0.01g (PV-60), 100g x 0.1g (PV-100), 200g x 0.1g (PV-200), and 500g x 0.1g (Pv-500).